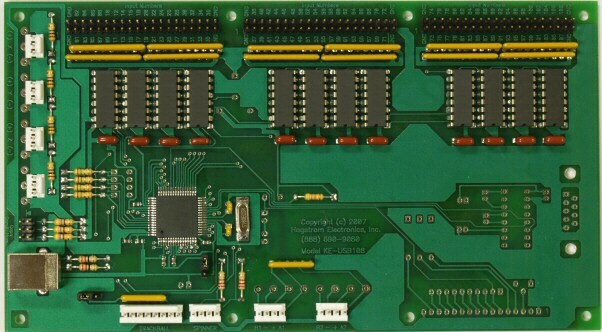 Logic level serial communication control performed at 9600 BAUD, 8 Bit, No Parity, 1 Stop Bit. The Relay-8 is powered from a regulated 5 Vdc source or use our KE-PWR5/2A power supply. 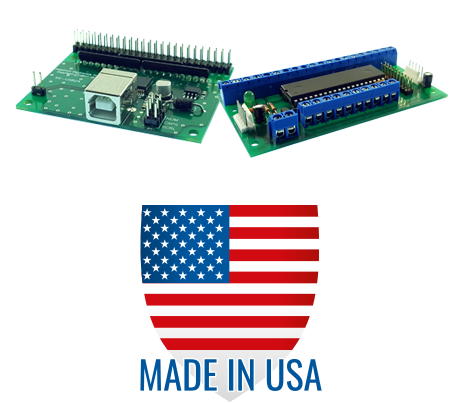 Use with our KE-232-IF cable to change the logic level transmit and receive lines to RS-232 levels. Provides 8 individual relays with contact ratings of 1 Amp at 24 Vdc and .50 Amp at 125 Vac. Screw terminal access for each output relay. Outputs are jumper configurable for normally open or normally closed operation. Status LEDs for each output shows its present state. Multiple Relay-8 modules may be daisy chained together and controlled from the same serial connection. Supplied with a printed user manual and disk containing a sample program which demonstrate techniques for communicating with the Relay-8. Special modifications and customization of the standard Relay-8 unit are typically ready for shipment in less than one week. Please contact us with your project requirements! Eight individual relays controlled by serial communication! 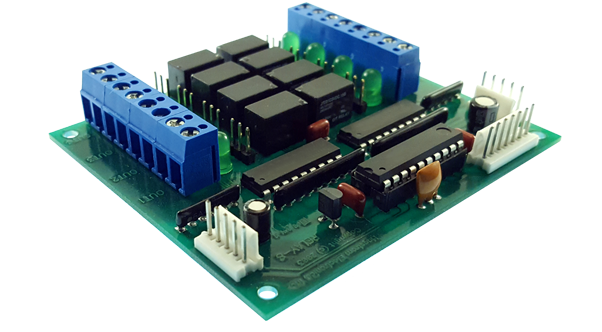 Our Relay-8 product provides 8 individual relays that are controlled by serial communication. 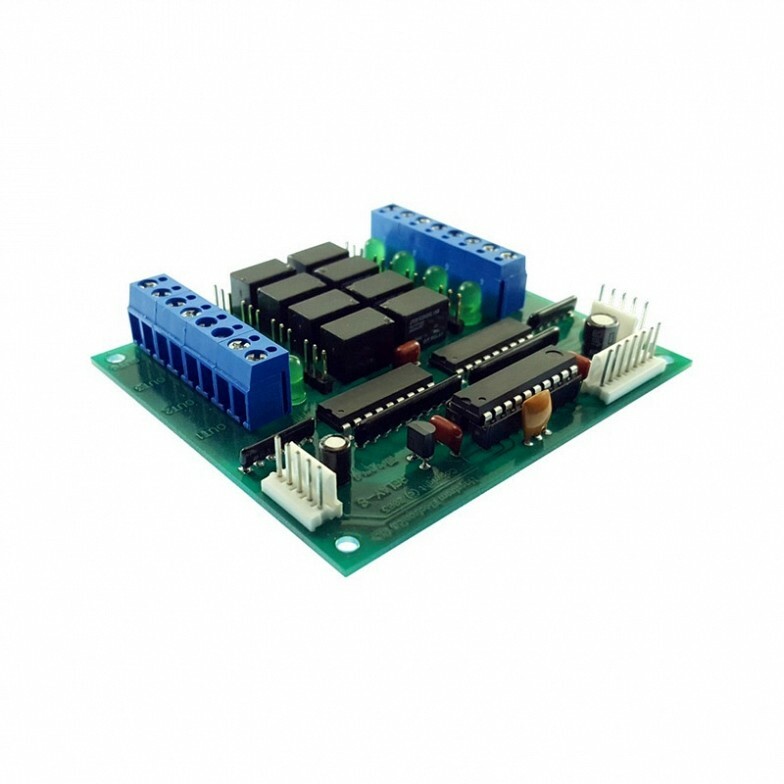 This unit operates from a single 5 Vdc regulated power supply. 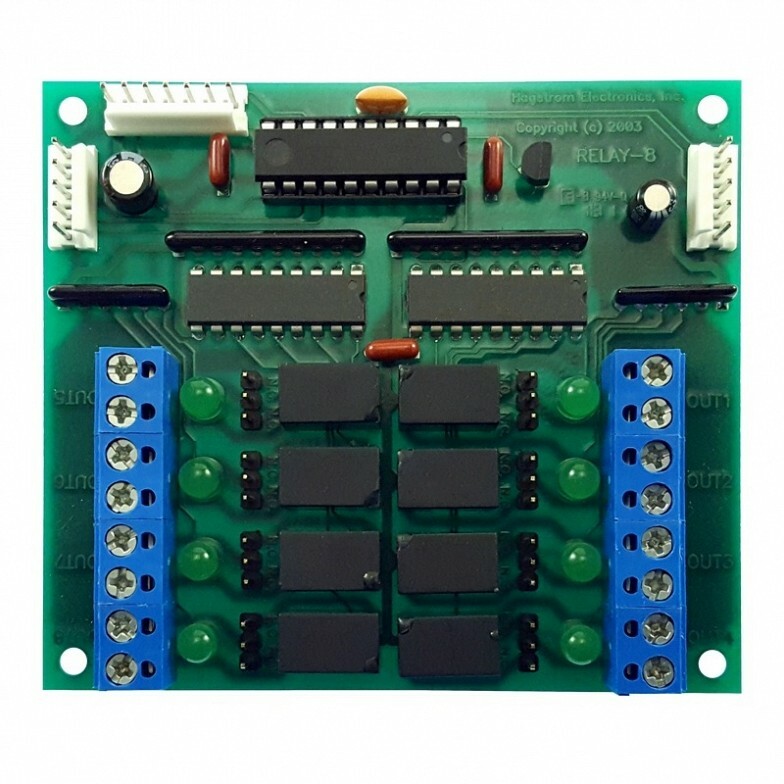 Serial communication parameters for the Relay-8 are 9600 BAUD, 8 Bit, No Parity, 1 Stop Bit, and are 5V logic level. 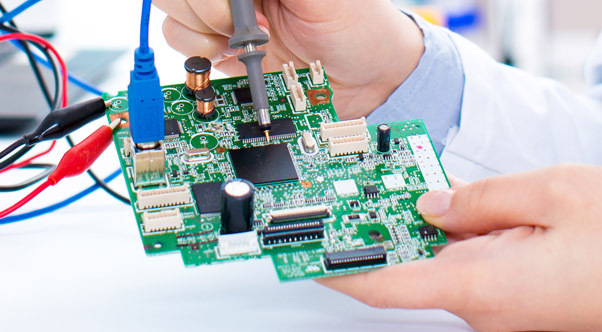 Many single board controllers can be attached directly with the logic level communication lines. Use our KE-232-IF cable with the Relay-8 to change the logic level transmit and receive lines to RS-232 levels. The relay outputs are available on the screw terminal headers of the Relay-8. Configuration jumpers are provided which allow for individual selection of normally closed or normally open contact states for each relay. Every relay has an LED indicator to show its present state. Communication to the Relay-8 is in the form of a three-byte packet which dictates the on and off status of each relay on the unit. The printed user manual details the form of the data packet and provides code examples on the included disk. Multiple Relay-8 units may be daisy chained together operating on the same serial stream to add more relay outputs for an application. 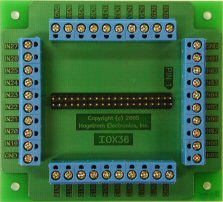 The unit uses jumpers to allow for the creation of a different communication address for each board if being used on the same serial data stream. Please contact us for project requirements that need a customization of the standard Relay-8 unit. Special modifications can include changes in communication rates, timers, or serial protocol, just to name a few examples. A customized Relay-8 can be ready for shipment in less than one week in most cases! *KE-232-IF - DB9 Female to 5 position Female jacketed interface cable for converting the Relay-8 logic level communication to RS-232 levels. Length = 4 feet. KE-PWR5/2A - 5.0V/2.0A Regulated DC power supply. 120 Vac Input. Domestic orders only! *MTA100-5-36-FF – 5 position Female to 5 position Female jacketed cable harness for daisy chaining Relay-8 modules together. Length = 3 feet.